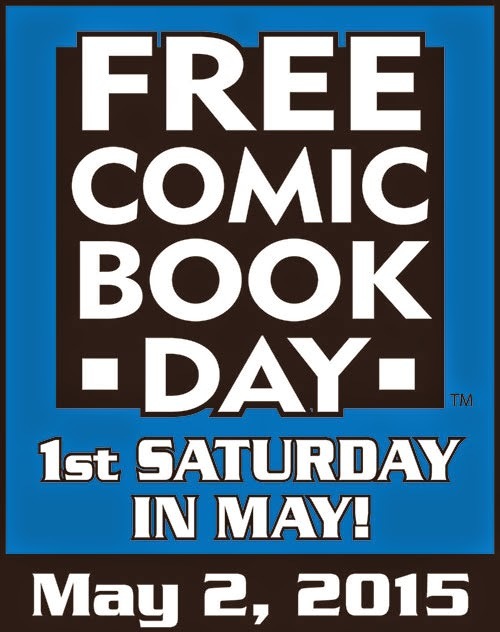 The Silver Sponsors for Free Comic Book Day (FCBD) feature a whole new selection of thirty-eight books for the comic book industry’s most anticipated annual event, Free Comic Book Day taking place Saturday, May 2nd at participating comic book shops worldwide. 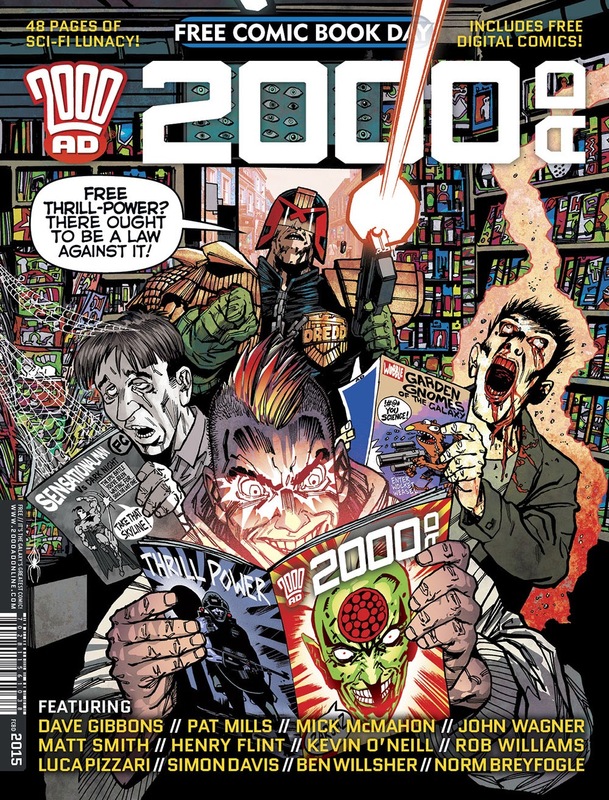 Retailers on the FCBD Selection Committee chose 50 titles overall, 12 Gold Sponsor Comics and 38 Silver Sponsor comics to provide fans a wide range of stories to choose from as well as new genres and publishers to discover. Titles from this year’s Silver comics include Teenage Mutant Ninja Turtles, Hip Hop Family Tree, The Tick, Street Fighter, Sonic the Hedgehog, Rabbids, and more. A complete listing of all fifty FCBD titles can be found in the January issue of Diamond’s PREVIEWS catalog, on sale at all comic book shops December 24th, 2014. For more FCBD news and updates visit www.freecomicbookday.com and become a fan on Facebook www.facebook.com/freecomicbook and follow on Twitter at www.Twitter.com/freecomicbook. Gronk is a monster… and not a very good one! 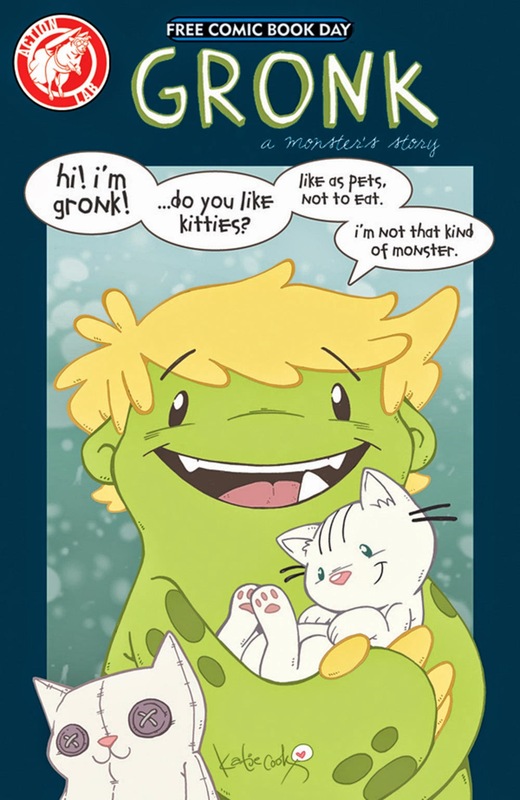 Follow Gronk’s continuing adventures as she learns about the world around her from her “teacher”, Dale, in this all-new Gronk story from fan favorite Katie Cook! 32pgs, FC FREE! This new Goldilocks may find that the Three Bears' boilers run “too hot” or “too cold”, that their armor plating is “too big” or “too small”, or that their mechs' piston-cycling is “too hard” or “too soft”. But when Rod Espinosa brings you yet another classic fairy tale spun Steampunk-style, the results will most certainly be “just right”! 24pgs, FC FREE! WORLDS UNITE: Prelude—It’s TWO Free Comic Books in ONE! 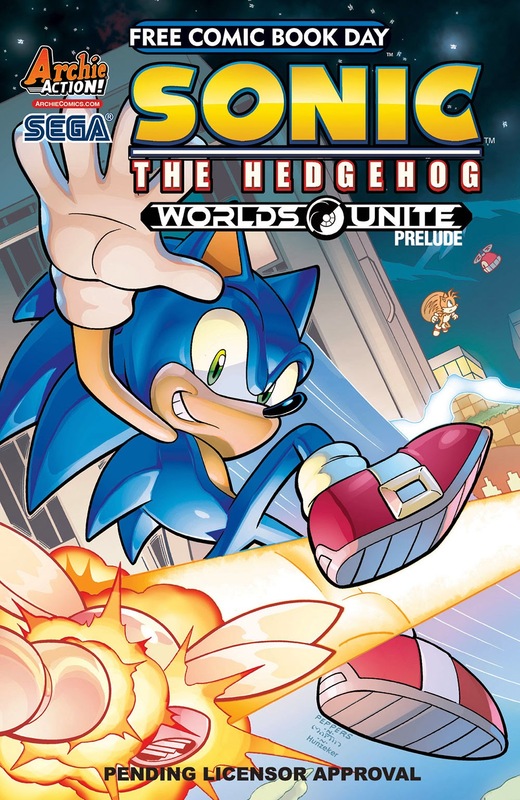 Just in time for the start of the All-New epic Sonic the Hedgehog and Mega Man crossover event, "Worlds Unite," comes a primer issue exclusively for Free Comic Book Day! The road to "Unite" began in the history-making "Worlds Collide" storyline, continued in 2013's “Dawn of X” storyline, and once again our heroes must meet — Mega Man's journey chronicled on one side, and Sonic the Hedgehog's on the other! This is the must-have primer for the biggest comic book event of 2015, as two video game icons must come together… or risk dying alone! Featuring art from both Sonic and Mega Man comic book fame! 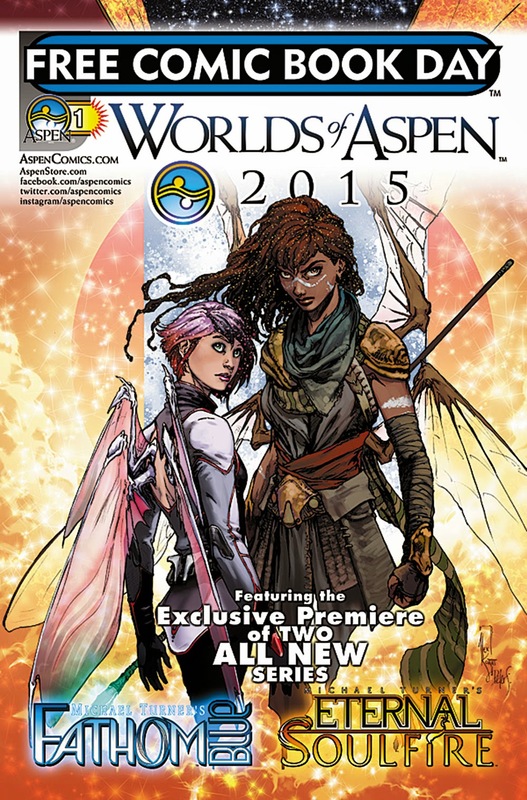 Two all-new FATHOM and SOULFIRE series begin right here! Michael Turner’s Fathom: Blue features a brand new cast of Blue outlaws from under the surface, coerced together by the U.S. Government for a covert war against their own kind — but if they fail their mission — their lives are over! Meanwhile, in Michael Turner’s Eternal Soulfire, a new wielder of magic emerges! Cassidy, a young girl with a huge power hidden within her, must place her trust in one of the Soulfire universes’ most fierce warriors, Miya, in order to escape not only those seeking to kill them—but also their own demons from the past! 32pgs, FC FREE! Looking Glasses shatter as heroes and villains from Wonderland arrive to aid or block Hatter in his quest to find Alyss. 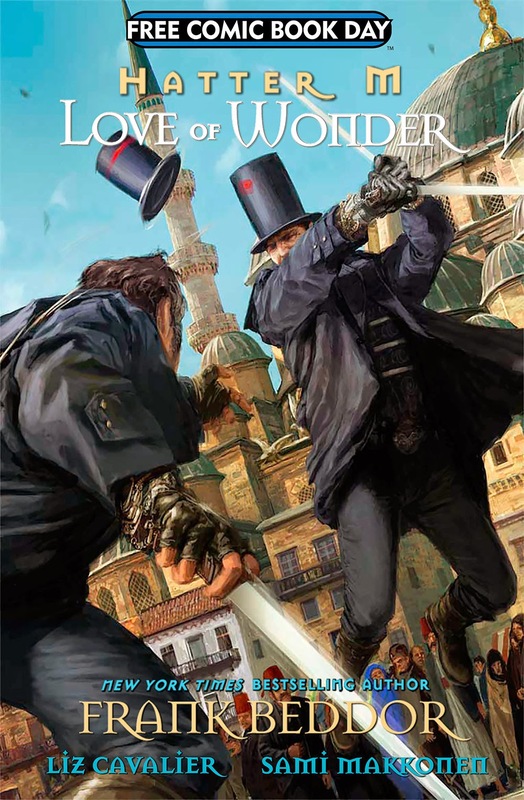 Hatter’s reunion with his brother Dalton leads to an epic showdown as savior meets assassin in the struggle for Wonderland’s future! 32pgs, FC FREE! Kieron Gillen blasts into Free Comic Book Day with an exclusive preview introduction to his all-new Sci-Fi series, Mercury Heat! Mercury: A slow-turning planet where you can outrun the sunrise and the blistering heat it brings… a new frontier, where humanity's insatiable need for energy is fed by a harsh environment worked by a rough crowd. And since she's just a bit too intense to be a cop on Earth, Luiza is bringing her own brand of heat to this inhospitable world! This special issue features the first chapter of this ongoing saga, a special introduction to the world of Mercury Heat, and a look at the ships, designs, and making of this epic! MATURE THEMES 32pgs, FC FREE! 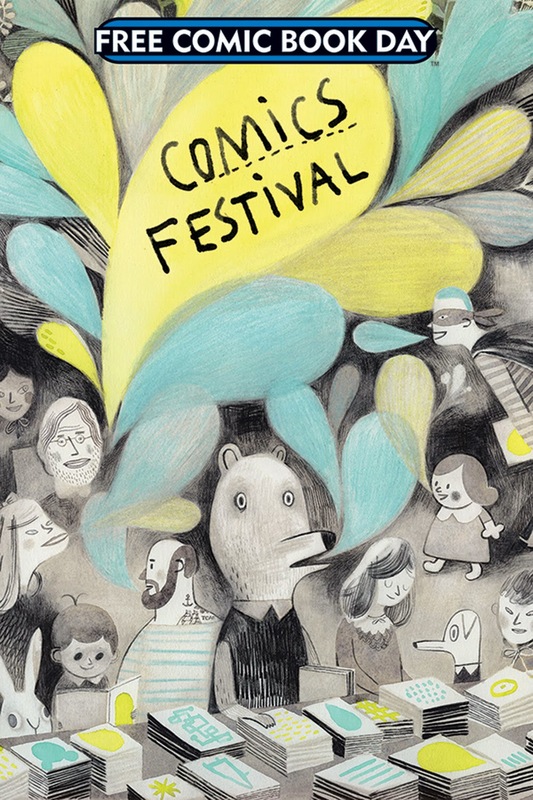 Comics Festival! 2015 continues the tradition of featuring all-new short stories by some of the greatest comics creators in Canada! It’s a wonderful showcase for existing and forthcoming comics and graphic novels! Not to be missed! 32pgs, FC FREE! A Free Comic Book Day 2015 sneak peek of the new, turbo-charged graphic novel by Kean Soo, author of the award-winning series Jellaby! March Hare wants to be the fastest and furriest racecar driver around. But first this rabbit racer must prove his skills at the speedway, on the streets, and in the desert! 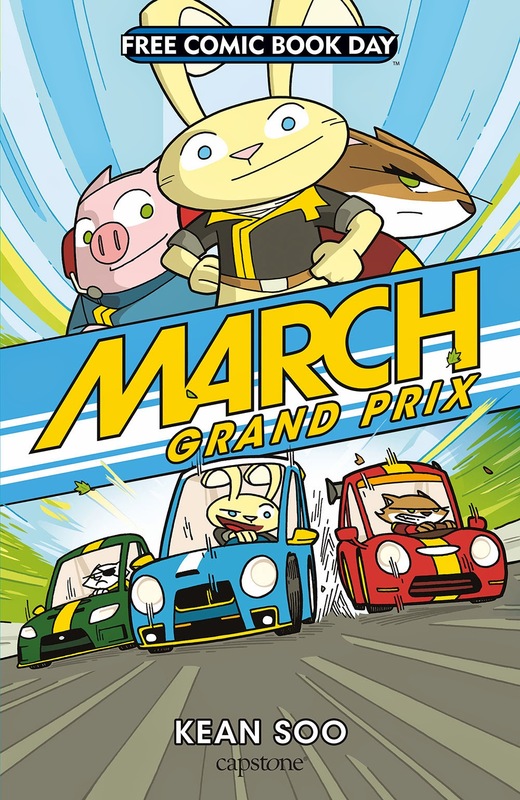 With pedal-to-the-metal illustrations and full-throttle action, March Grand Prix is sure to be a winner! Featuring a full tank of bonus materials: creator Q & A, pin-up art, and much more! For over 25 years, the CBLDF has fought to protect your right to read, and that crusade continues with this light-hearted look at a serious topic. 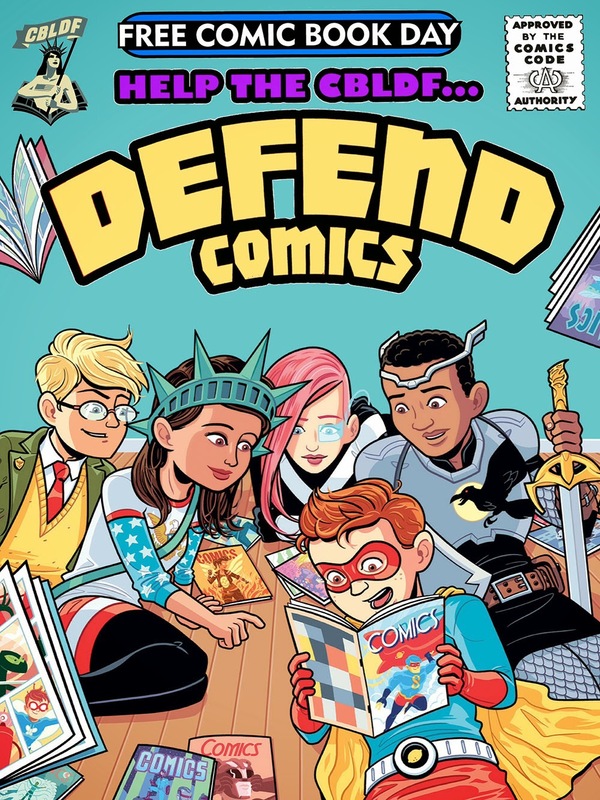 DEFEND COMICS is a sampler of the great YA comics available, and explores the censorship of comics with some of today's most talented creators! 32pgs, FC FREE! When Tom Evans and his brother Michael gain superpowers from an alien artifact, they both must work through a lifetime of differences to ensure their gifts are used for the betterment of mankind. 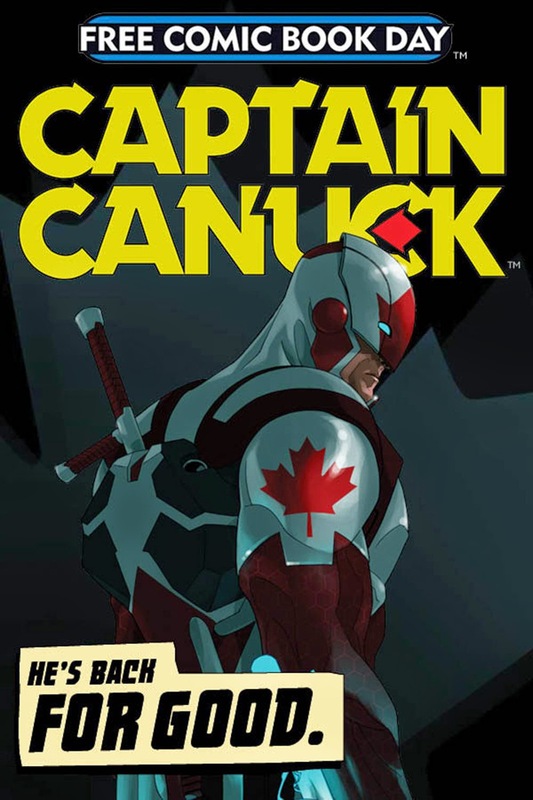 Thrust into battle by fledgling intervention agency Equilibrium, Tom becomes figurehead and hero Captain Canuck, fighting to not only save humanity, but his brother's soul, from the evil forces that lurk in the shadows. The classic Canadian comic book hero is reborn in this #0 issue for FCBD! 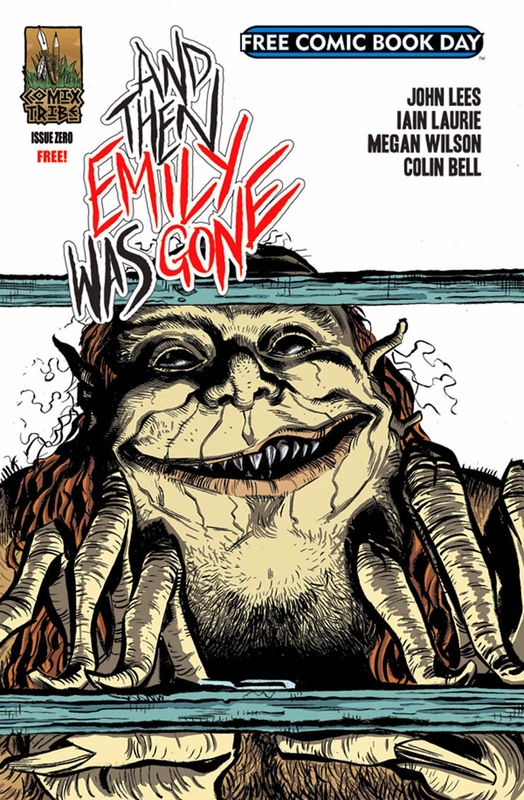 A chilling prelude to the cult horror sensation, And Then Emily Was Gone! Bonnie Shaw is a terrifying creature of Scottish folklore who would grant parents their hearts' desire... in exchange for their child. Young Billy McTaggart has nothing to fear from Ol’ Bonnie, as his mother and father love him, don't they? DON’T THEY?! 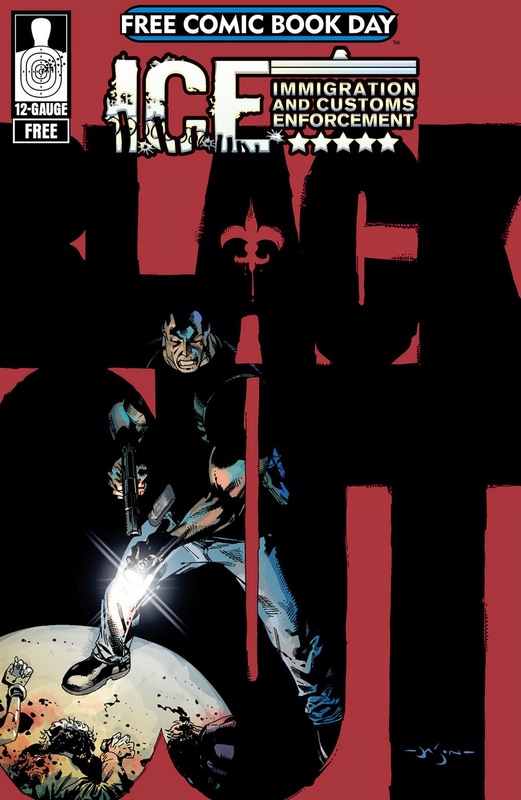 Featuring a cover by superstar artist Ryan Stegman (Inhumans). 32pgs, FC FREE! All-ages action, fantasy, and humor! All-new stories that make great entry points to new worlds! Gene Luen Yang and Carla Speed McNeil deliver an Avatar: The Last Airbender adventure! Dr. Zomboss and Crazy Dave clash in a new Plants vs. Zombies battle! And the crafty Bandette stars in a tale of her own! 32pgs, FC FREE! A special, Top Secret project too big to announce! Please check back in the February issue of PREVIEWS and at freecomicbookday.com for future updates! 32pgs, FC FREE! Drawn & Quarterly celebrates its 25th year in publishing with this all-ages FCBD edition previewing two of its biggest books for 2015! Kate Beaton is back with Step Aside, Pops! her follow-up to her best-selling debut, Hark! A Vagrant, with more irreverent and hilarious comics on history and literature. Sharing the billing is Jillian Tamaki, co-creator of Skim and This One Summer. 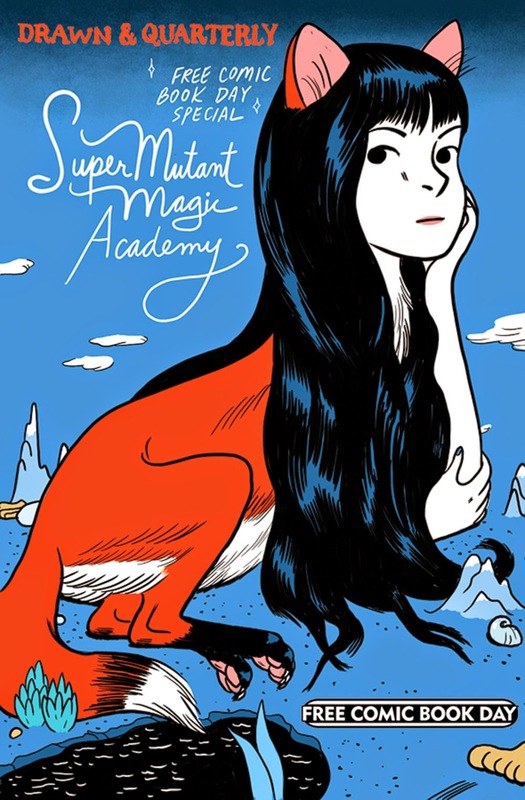 SuperMutant Magic Academy, which Jillian has been serializing online for the past four years, paints a teenaged world filled with just as much ennui and uncertainty, but also with a sharp dose of humor. 32pgs, FC FREE! 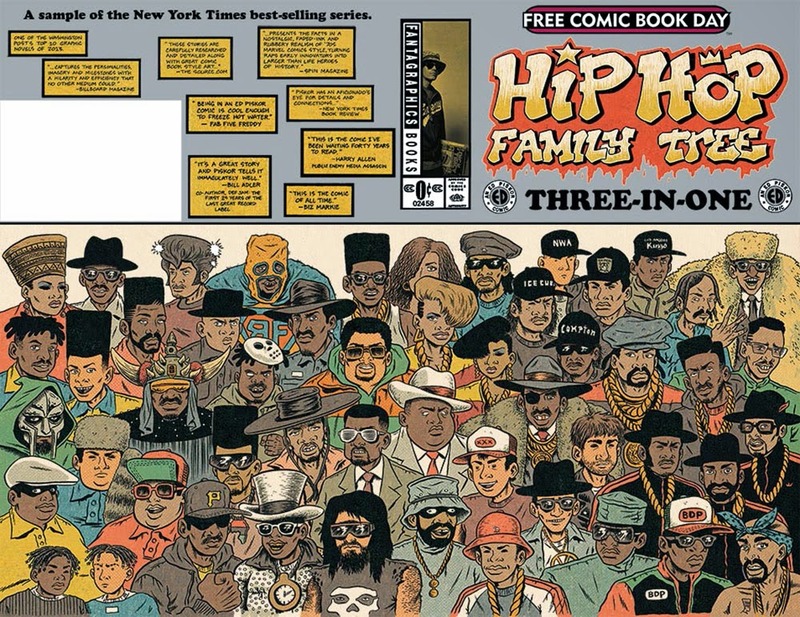 Featuring Ed Piskor’s Hip Hop Family Tree series and Dash Shaw’s Cosplayers! Piskor’s half features excerpts from all three existing HHFT volumes, plus the Rob Liefeld/Spike Lee commercial adaptation and exclusive pinups by R. Crumb, Scottie Young, Jim Rugg, Ben Marra, and more! Shaw’s side delivers an all-new, 24-page issue of his thoughtful and funny exploration of human endeavor and social interaction as seen through the lives of two cosplayers. Enjoy the works of two of the great contemporary graphic novelists of their generation! 56pgs, FC FREE! When Action Comics #1 sells for $3.2 million, Incredible Hulk #1 sells for $326,000, the original art for Wolverine's first brief appearance sells for $657,000, and when cosplay has exploded to unparalleled heights, it's time for a look inside the market! 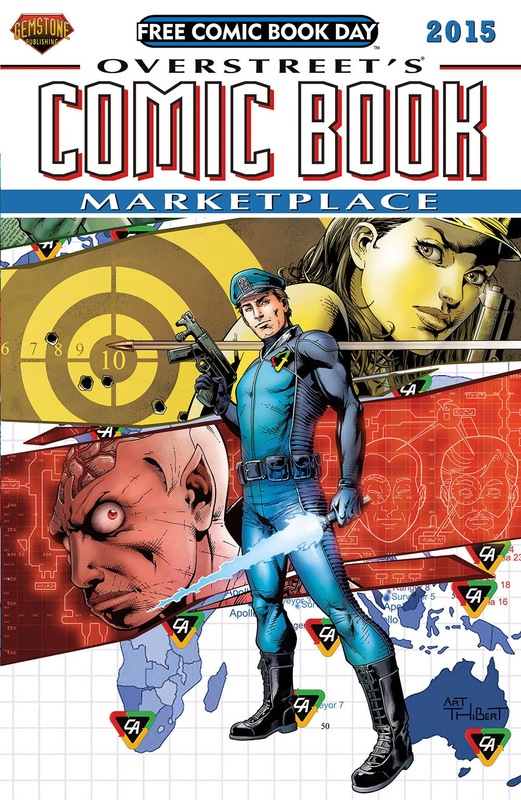 The Free Comic Book Day 2015 issue of Overstreet's Comic Book Marketplace — from the team behind The Overstreet Comic Book Price Guide and the new Overstreet "How To" series — is a perfect introduction to the fun and history of comic book collecting! 32pgs, FC FREE! 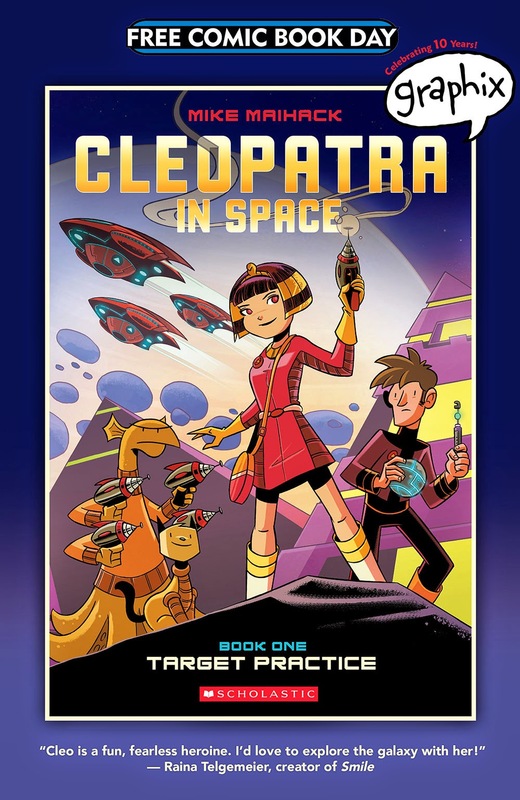 When a young Cleopatra (yes, that Cleopatra) finds a mysterious tablet that zaps her to the far, really far future, she learns of an ancient prophecy that says she is destined to save the galaxy from the tyrannical rule of the evil Xaius Octavian! 32pgs, FC FREE! 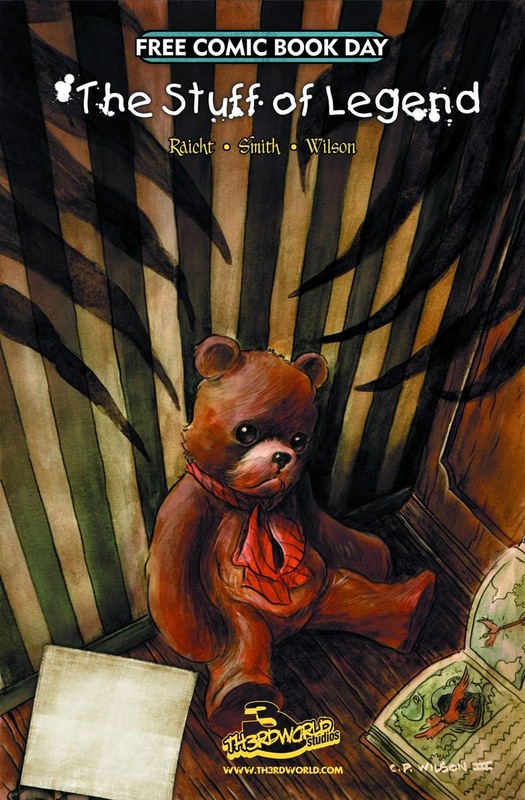 The Phantom, the grand-daddy of costumed heroes celebrates Free Comic Book Day 2015 with a volume showcasing stories by some of the greatest artists to ever create tales for this ground-breaking title featuring The Ghost Who Walks. 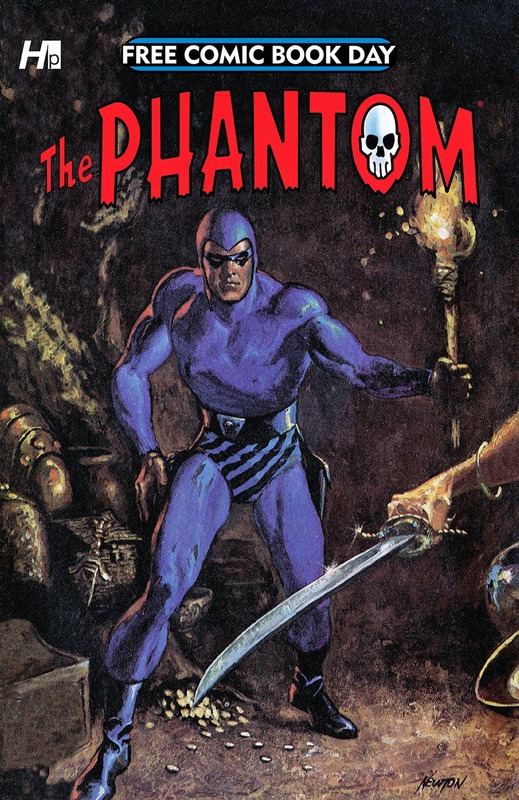 This 32 page book will feature work from the Gold Key and King Phantom comics created by Bill Lignante; from the Charlton Phantom comics created by Jim Aparo and Don Newton and will offer samples of the newest Phantom story created by Peter David and Sal Velluto. Hermes Press' Phantom FDBD issue will also offer bonus material and tons of surprises! 32pgs, FC FREE! The Turtle's final battle with Shredder begins here! 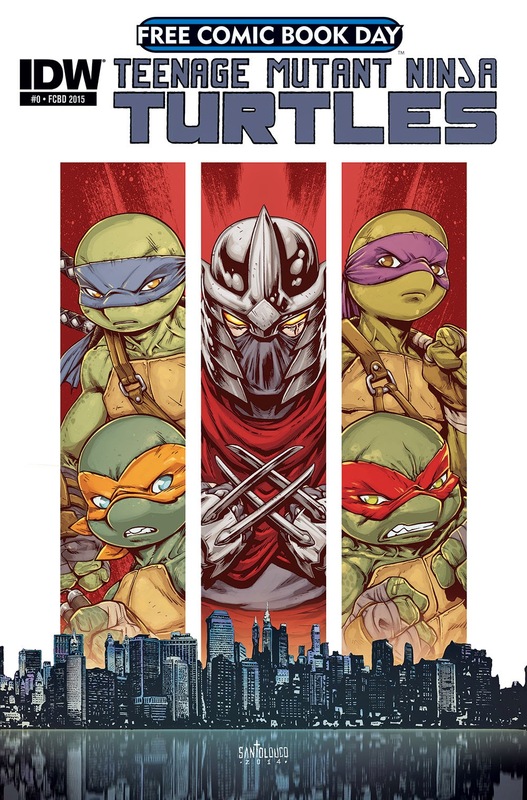 This book will take us inside the minds of key characters in the TMNT universe, revealing the epic moments that have led to the present, as well as setting the stage for the biggest storyline yet with all new material! 32pgs, FC FREE! An original Honor Harrington story! 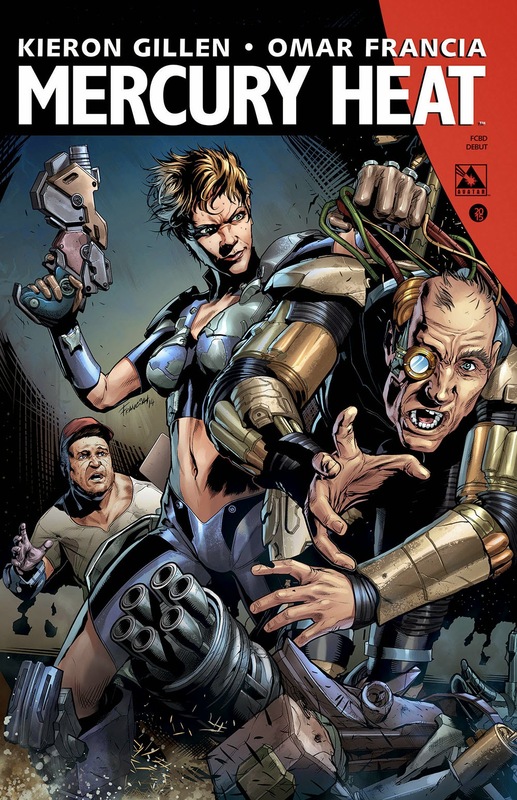 Set in the universe of the best-selling military science fiction novels by David Weber, this self-contained zero issue is the lead-in for the new ongoing series also launching in May. 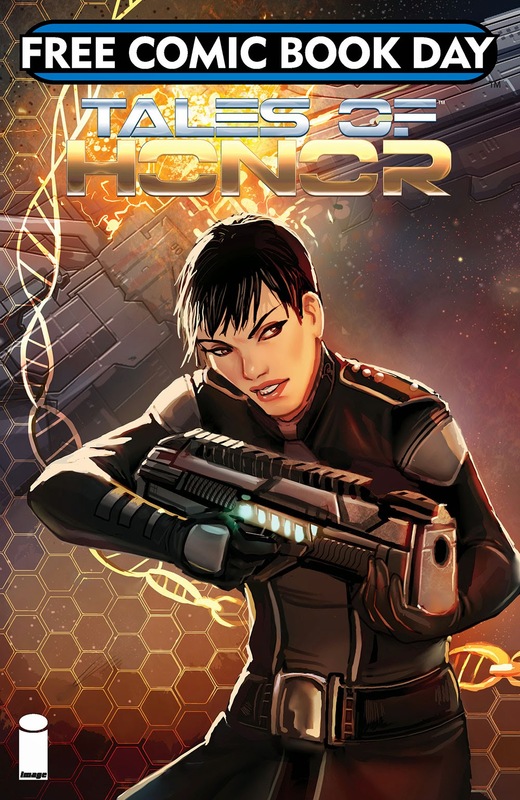 On patrol in the Silesian Confederacy, Honor and her crew chase a pirate vessel, only to have it eject its human cargo of slaves into space! Horrified at the callous disregard for life, the crew of the HMS Fearless investigates and uncovers a vast conspiracy by the planet Mesa to provide genetically-enhanced slaves to the seedy underbelly of the various Star Kingdoms. 32pgs, FC FREE! 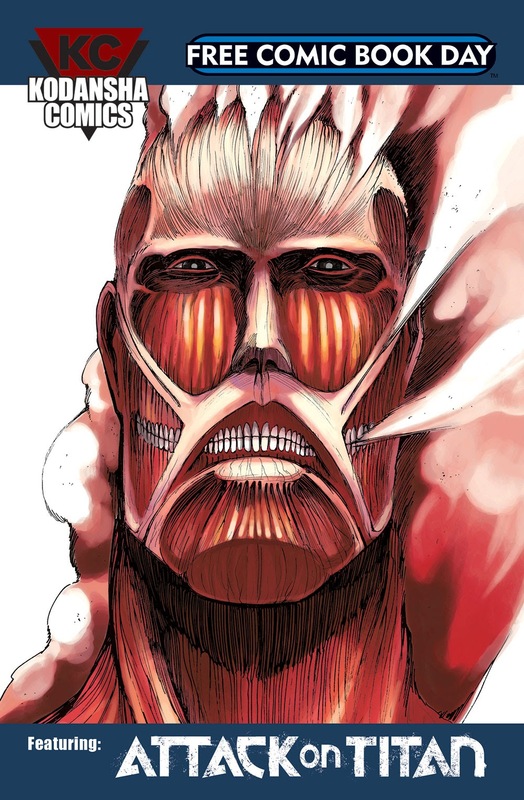 If you aren't reading Attack on Titan, you're missing out on the biggest manga and anime phenomenon to sweep the world in years! But don't worry. Now you have the chance to see what all the fuss is about with an excerpt from the first volume, along with samples from other top manga series, including Fairy Tail, The Seven Deadly Sins, Noragami, and more! SC, 5x7, 96pgs, B&W FREE! Working with industry-leading talent such as Grant Morrison, Frazer Irving, Matt Wagner, Simon Bisley, Judd Winick, Geoff Shaw, Jonathan Hennessey and Shane Davis, we've created an ever-growing library of thrilling sagas including Annihilator, Epochalypse, A Town Called Dragon, The Harvester, The Tower Chronicles: DreadStalker and more, alongside cinematic tie-ins such as Godzilla: Awakening and the best-selling Pacific Rim: Tales from Year Zero. 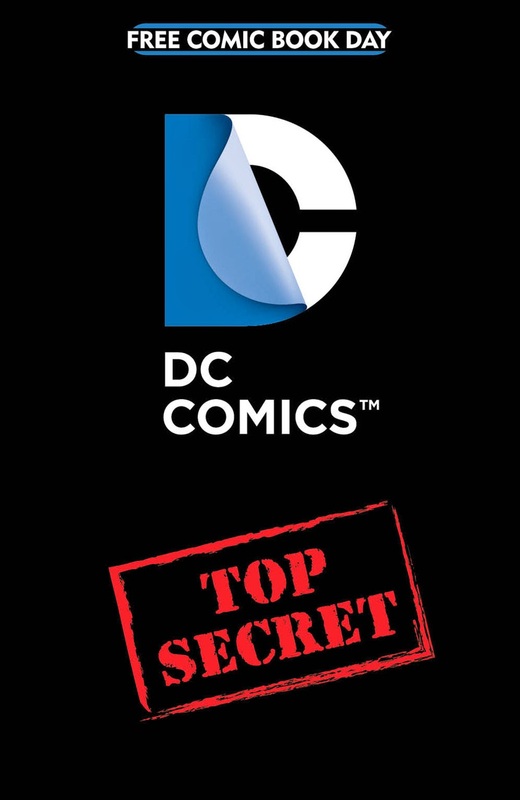 Join us this Free Comic Book Day as we unveil an exclusive first look at the exciting next chapter of Legendary Comics! Based on the animated shorts seen on Angry Birds ToonsTV, Stan Lee’s Chakra The Invincible is the latest superhero creation from the legendary co-creator of Spider-Man, X-Men, The Avengers, Iron Man, and more! 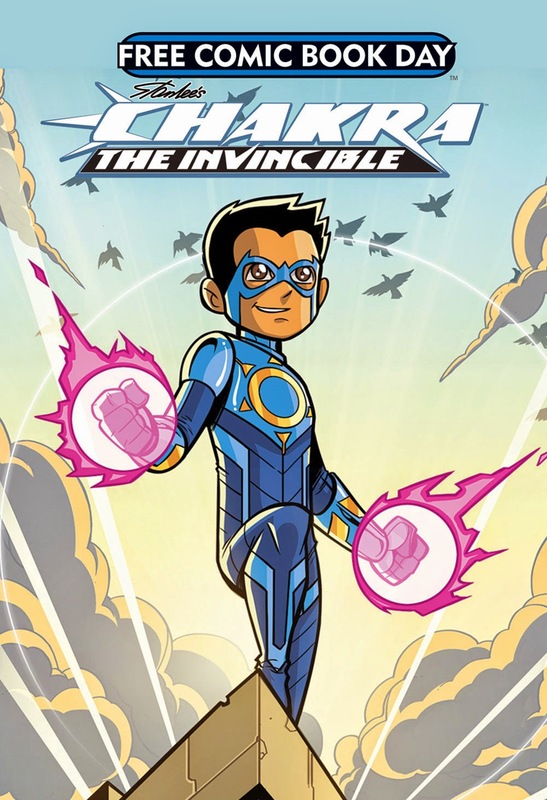 This all-ages comic features short tales of Chakra the Invincible for kids and superhero fans of all ages! 32pgs, FC FREE! 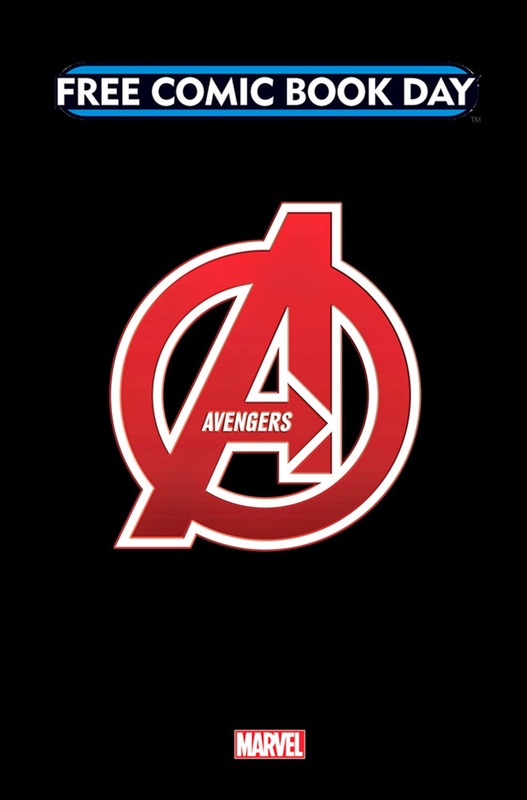 What better way to celebrate Free Comic Book Day then by assembling Earth’s Mightiest — and most popular — Heroes?! Iron Man! Captain America! Thor! Black Widow! Hawkeye! Hulk! The Vision! Everyone’s favorite heroes take on a dangerous new threat in this FCBD spectacular! 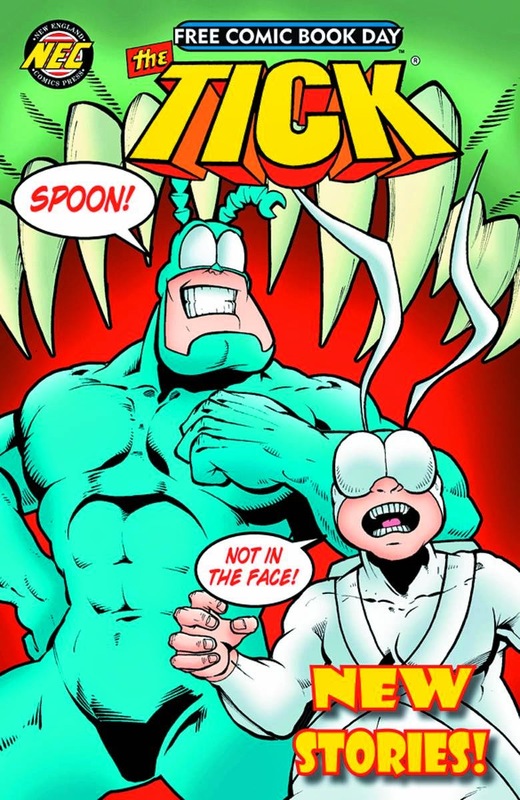 The Tick returns for FCBD 2015 with 32 pages of full-color comic book fun! In the all-new lead story, The Tick and Arthur’s apartment is haunted by a ghost from The Tick’s mysterious past — an entity who claims to be The Tick’s first sidekick — and it won’t rest in peace until... well, we can’t give away everything, can we?! Plus, still more full-color fun featuring The Tick! Great for fans new and old! 32pgs, FC FREE! The touching story of a girl and her T-Rex… with a healthy dose of collateral damage and kaiju fighting on the side! When the scientists of Cosmos Labs punch a hole through spacetime, they pull a ferocious dinosaur into the present! The dinosaur imprints on teenager Jessica, proving to be more mischievous than vicious. But he is not alone, as transdimensional monsters begin attacking our world! Now Jessica and her new friend “Wrex” must save the universe! 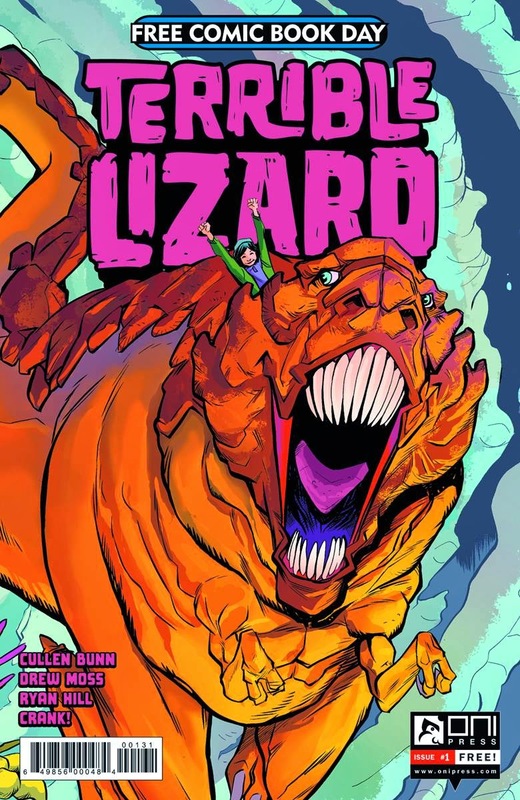 For fans of bad science, dinosaurs, giant monster battles, and friendship, the all-ages-friendly and action-packed Terrible Lizard begins here! 32pgs, FC FREE! 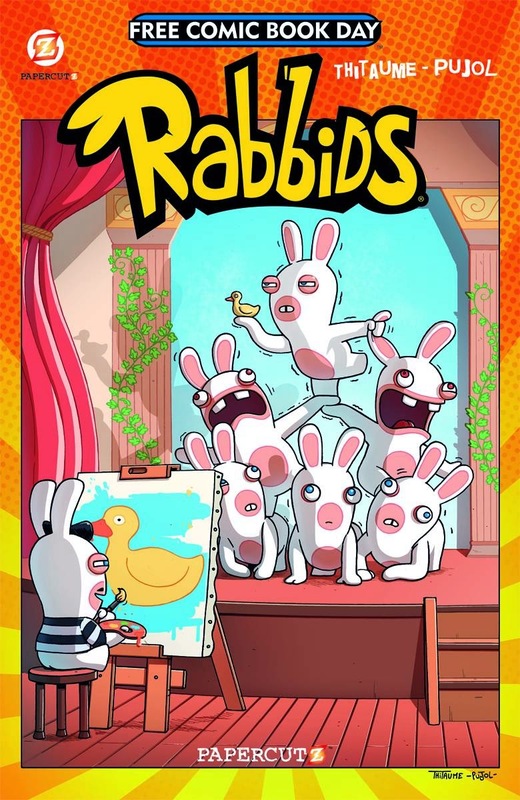 Spinning out of the hit videogame and TV series, the Rabbids are taking over FCBD in this fun-filled comic book! Their hilarious antics are sure to entertain fans of all ages! 32pgs, FC FREE! Back in print for the first time in two decades! 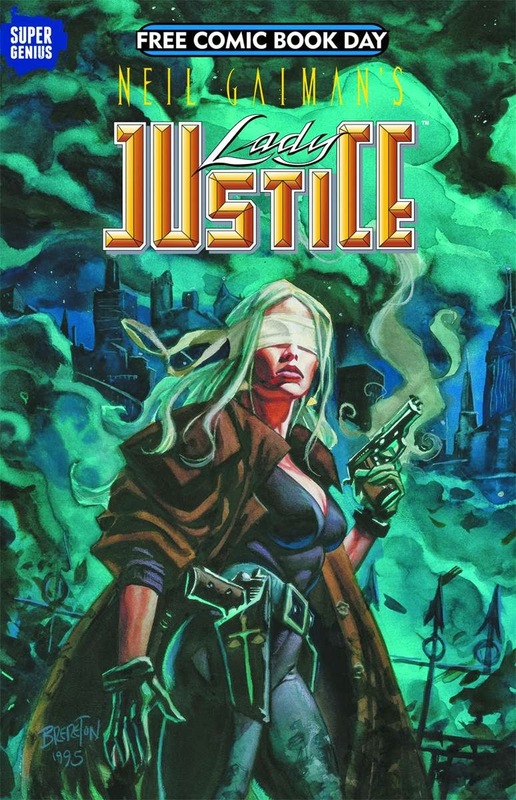 This Lady Justice FCBD Edition reprints issue #1 of Neil Gaiman’s lost comics classic! 32pgs, FC FREE! The galaxy’s greatest Eisner-nominated SF anthology returns to Free Comic Book Day with a 48 page zarjaz line-up of stories! Inside you’ll find: Judge Dredd in ”Through the Out Door”, a brand new story from Matt Smith and Norm Breyfogle; The Traveller from Mick McMahon; Ajax Bloodthirsty in a new tale from Ben Willsher and Barry Krishna; Nemesis the Warlock in “Tomb of Torquemada” by Pat Mills and Kevin O’Neill; Doctor Sin returns to pass on his mantle in “Don’t Call It A Comeback” by Rob Williams and Luca Pizzari; Dan Dare from Dave Gibbons and Gerry-Finley Day; Sláine stars in “A Simple Killing” by Pat Mills and Simon Davis; classic Judge Dredd newspaper strips by John Wagner, Alan Grant and Ron Smith; and Tharg’s Alien Invasions from Henry Flint! All this, plus a FREE digital story attached! 48pgs, FC FREE! 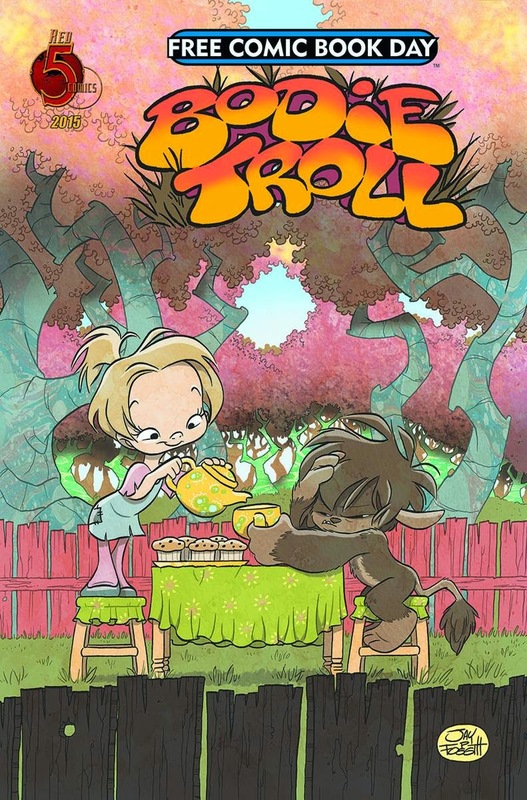 With a mix of playfully irreverent humor, attention-grabbing art and incredible heart, Bodie Troll is a perfect first comic to give to a non-comic-reader of any age! In an all-new exclusive adventure, things turn ugly for cute Bodie Troll when he gets hijacked into that most agonizing of events — a little girl’s tea party! Plus, an all-new adventure from the world of Drone, and previews of 2015 Red 5 favorites and new faces! 32pgs, FC FREE! Left scattered across The Dark in the aftermath of the Boogeyman's deceit, our band of heroic Toys must pick up the pieces or risk losing their boy forever in this Preview of The Stuff of Legend Volume 5: A Call to Arms! 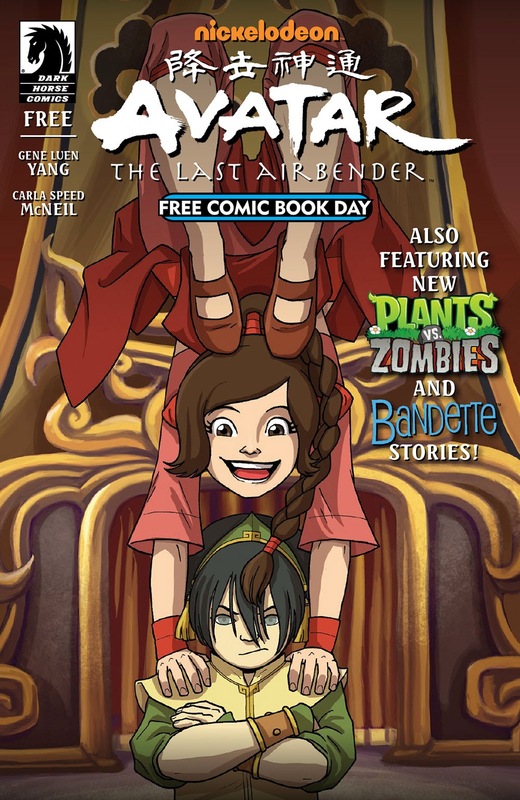 Also featured in this flip-book style FCBD issue is a preview of the brand new, all-ages original graphic novel series being hailed as the next Avatar: The Last Airbender — Thanatos Diver! A young girl opens a portal to strange new worlds in a sunken city, and unwittingly releases a mythical being of immense power, the mythical Thanatos Diver! 32pgs, FC FREE! Look hard into the storm clouds. You may yet see her, mounted on her electric steed, streaking past. The last hero of the West… THE MOTORCYCLE SAMURAI! It's been called “the new benchmark for indie digital comics." 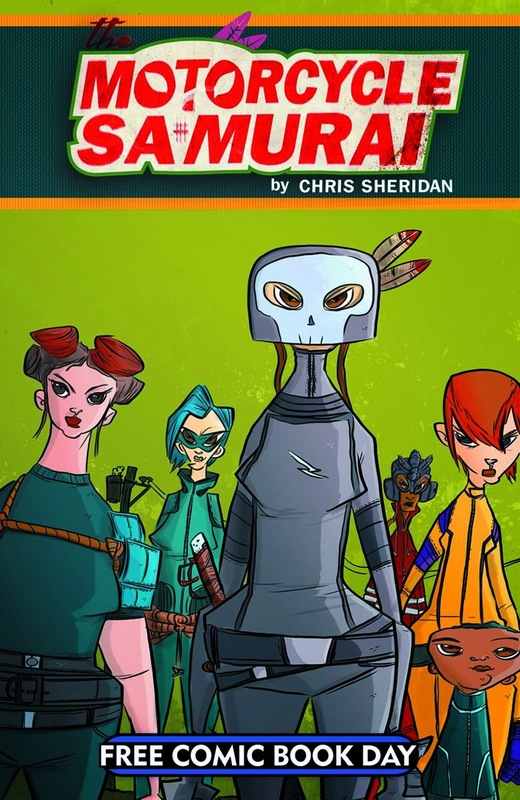 Now discover the mad genius of The Motorcycle Samurai for yourself, as Chris Sheridan does the unthinkable: brings his creation to print! Top Shelf celebrates FREE COMIC BOOK DAY with 24 pages of full-color action, whetting appetites around the world for the future release of The Motorcycle Samurai graphic novel. Now saddle up and let's ride! 24pgs, FC FREE! When a group of Chechen mercenaries attacks New Orleans, I.C.E. agents Cole and Ezra must stop them before they can complete their mission to destroy a main hub of the US power grid! To keep these murdering psychopaths from achieving their goal, Cole must let go of his fear and unleash his true self. As an added bonus, this FCBD issue includes an extended preview of the next installment of critically acclaimed anthology The Ride, from writer Ron Marz and artist Nelson Blake! 32pgs, FC FREE! 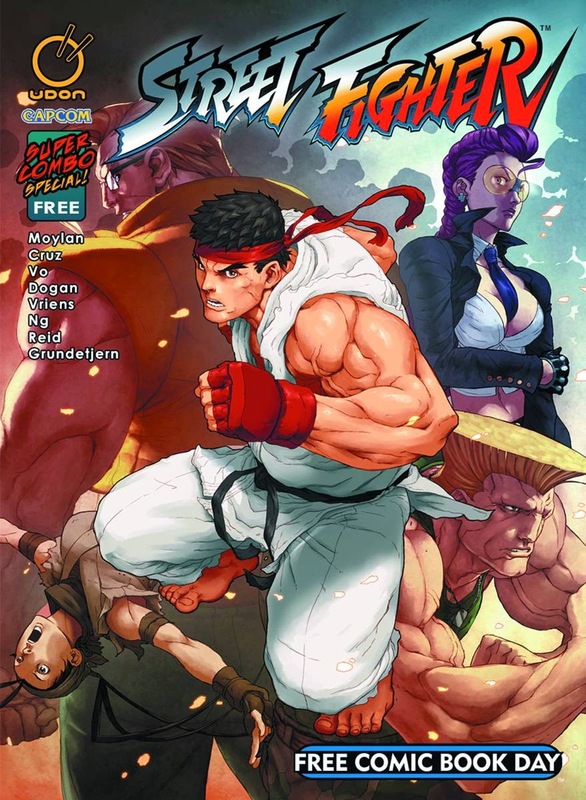 Five generations of World Warriors collide in this epic new Street Fighter story for Free Comic Book Day 2015! Ryu, Charlie, Crimson Viper, Ibuki, and more put their martial arts skills to the test as they battle across the globe. A self-contained story, perfect for newcomers to the Street Fighter universe, or longtime fans! 6x9, 32pgs, FC FREE! 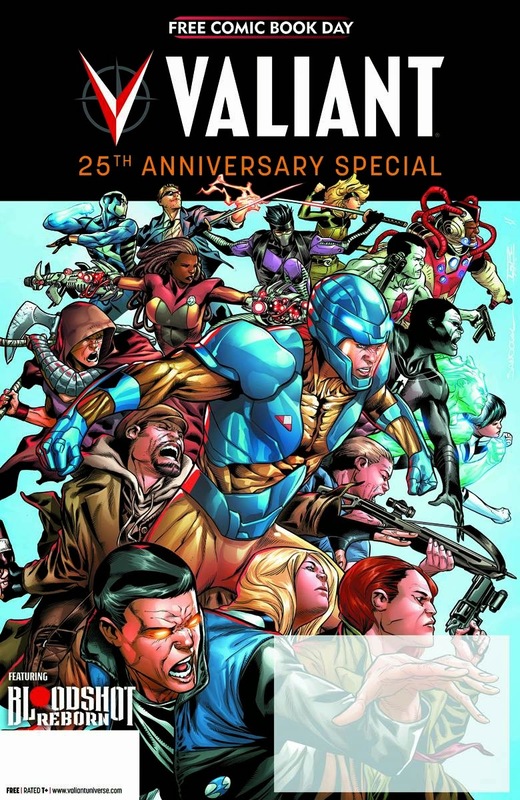 Valiant's 25th year is going to be the biggest one yet! The silver anniversary celebration begins right here on Free Comic Book Day! Bloodshot, X-O Manowar and the rest of Valiant's fearless heroes are taking center stage for a star-studded, jam-packed anniversary smash celebrating 25 years of Valiant comics! Featuring an essential selection of brand-new stories and never-before-seen artwork, alongside exclusive interviews and "best of" features, jump on board here to relive the ground-breaking journey that established Valiant as the largest and most acclaimed independent universe in comics — and witness the action-packed first steps toward 25 more history-making years! 32pgs, FC FREE! 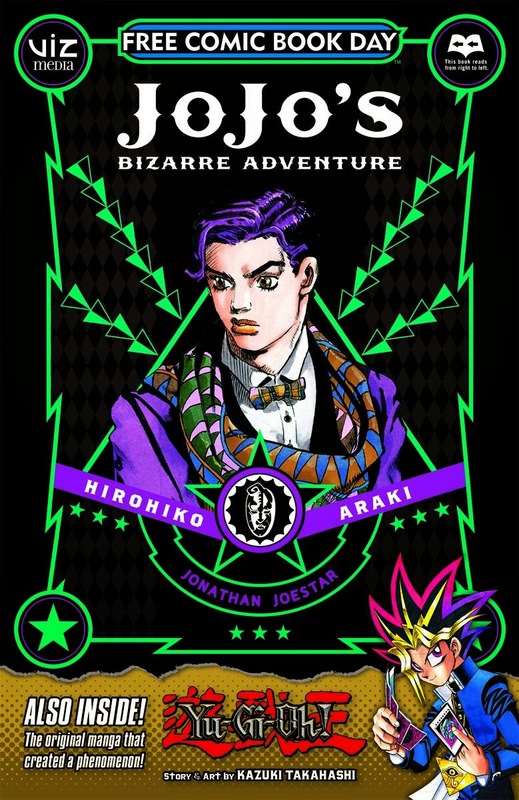 JoJo’s Bizarre Adventure, from Hirohiko Araki, is a groundbreaking manga famous for its outlandish characters, wild humor and frenetic battles. A multigenerational tale of the heroic Joestar family and their never-ending battle against evil! Yu-Gi-Oh! by Kazuki Takahashi tells the story of 10th grader Yugi, a game obsessed kid who one day solves the “Millennium Puzzle”, an Egyptian artifact that holds the spirit of a master gambler from the age of the Pharoahs! Possessed by the puzzle, Yugi becomes Yu-Gi-Oh, the King of Games, and battles evildoers in the Shadow Games... weird games with high stakes and high risks! 32pgs, FC FREE! Zenescope has published over 100 Wonderland comics and spinoff comics since 2007. 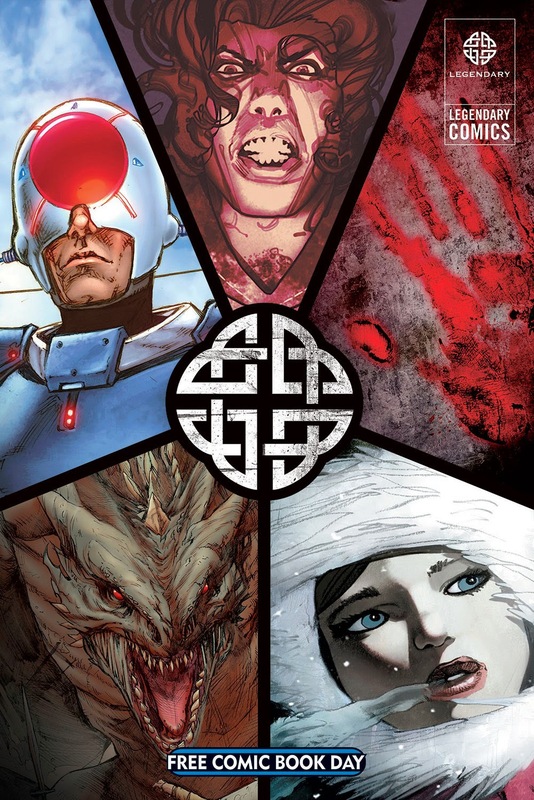 Now this special Free Comic Book Day offering will give readers a chance to jump on board the incredible, mind-warping horror series that will leave you wanting more! Travel down the rabbit hole and rediscover the madness! 32pgs, FC FREE! This is the prequel issue to Silver Dragon Books’ All-Ages hit series featuring Earth’s Original Heroes! The evil Zalex has returned to shatter Earth’s peace with his army of mutated dino-soldiers. 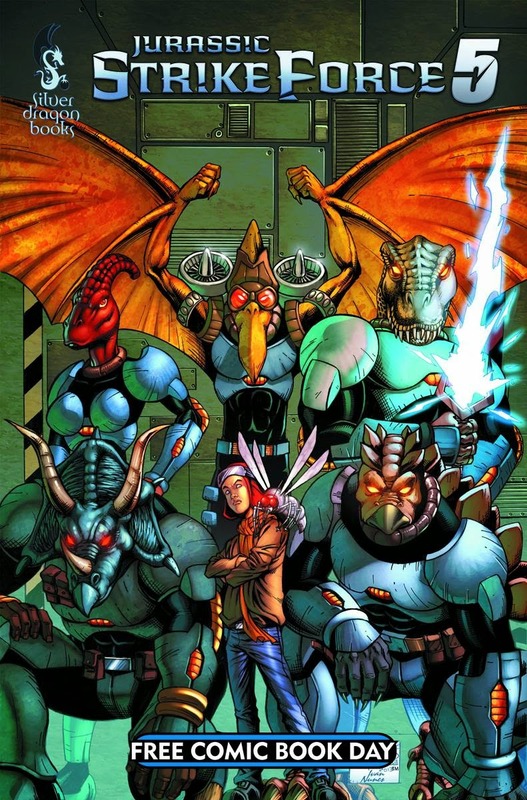 Now the Jurassic Strike Force 5 will be called into action to stop Zalex’s evil plan! 32pgs, FC FREE!